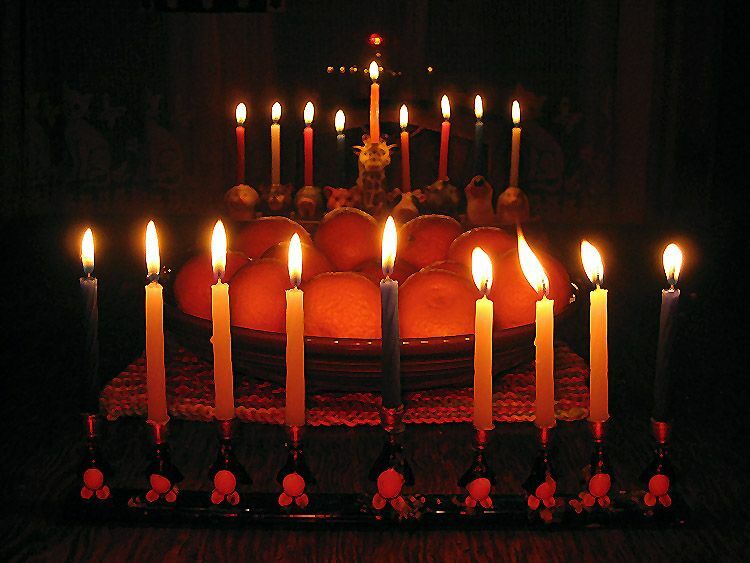 On the eighth and last night of Hanukkah, all the candles in the menorah are glowing, shedding a warm and wonderful light. In this pair of photos, a Fiesta heather 70th anniversary commemorative presentation bowl (filled with California “cuties”) is flanked by the Noah's Ark menorah and another made from glass penguins. 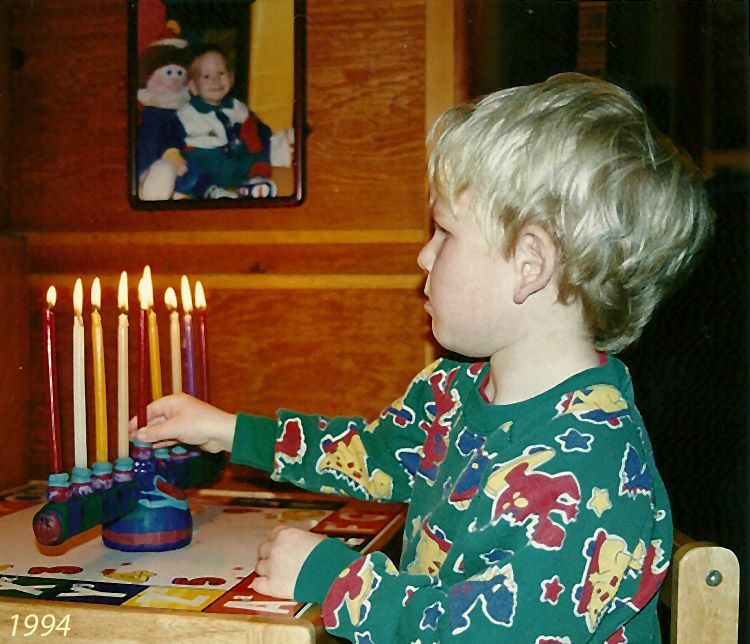 This 1994 photo of our son shows him lighting the menorah he described in his introduction…it was made by his father out of an old showerhead and a stick, covered with Fimo clay! 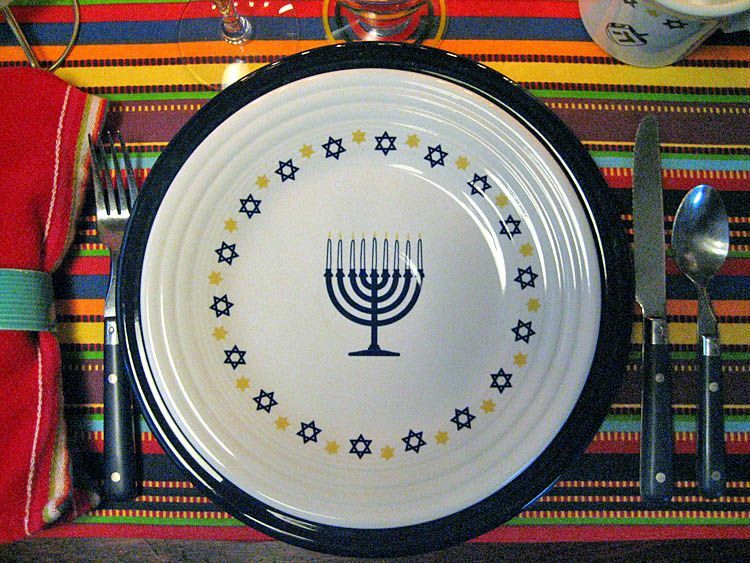 It’s a Fiesta Hanukkah! For my eighth night table I’ve chosen a mostly contemporary setting. The decalled white Fiesta luncheon plate and mug ( exclusive to dinnerwarepresale.com ) join a post-86 cobalt Fiesta dinner plate, and the striped placemat is a Fiesta licensed accessory from JC Penney. The napkin (Target) and flatware are also modern. Only the glassware is vintage in this table setting, but unfortunately I don’t know the manufacturers. 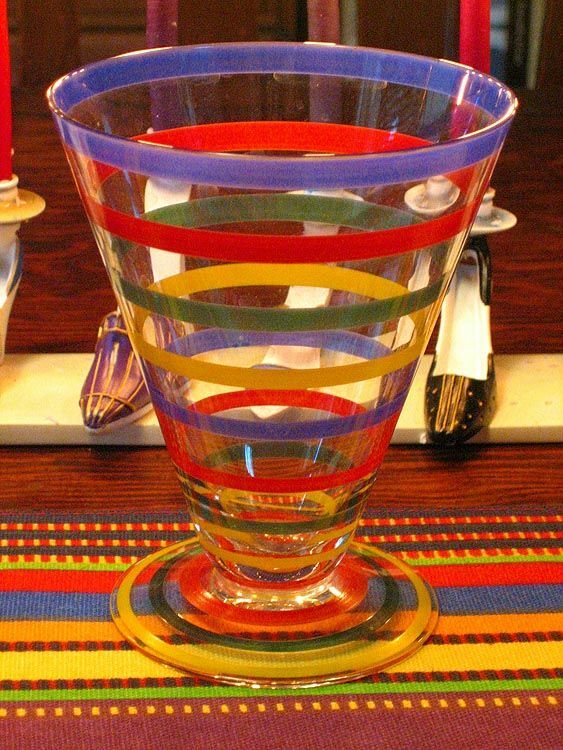 The banded, pilsner-shaped glass probably dates from the 1930s. The wine glass is vintage also, but I haven’t been able to find any photographic references (even in Candy’s impressive collection of vintage glassware advertisements!) 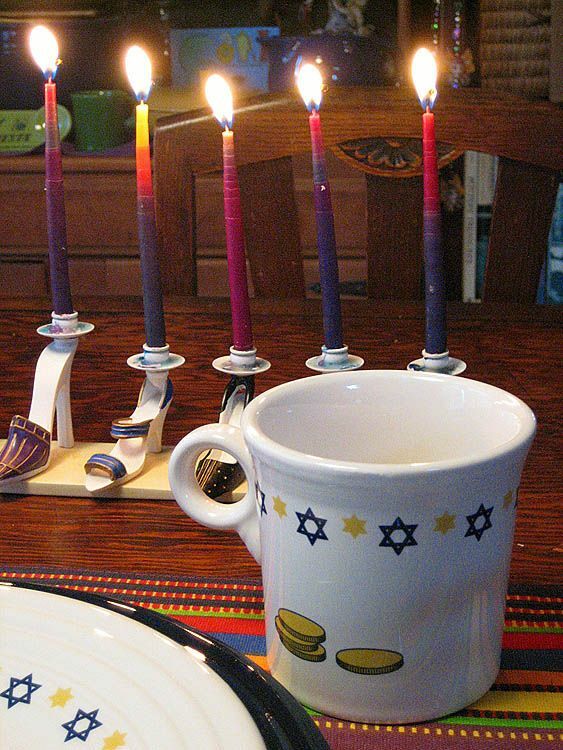 A contemporary shoe menorah adds a whimsical touch. 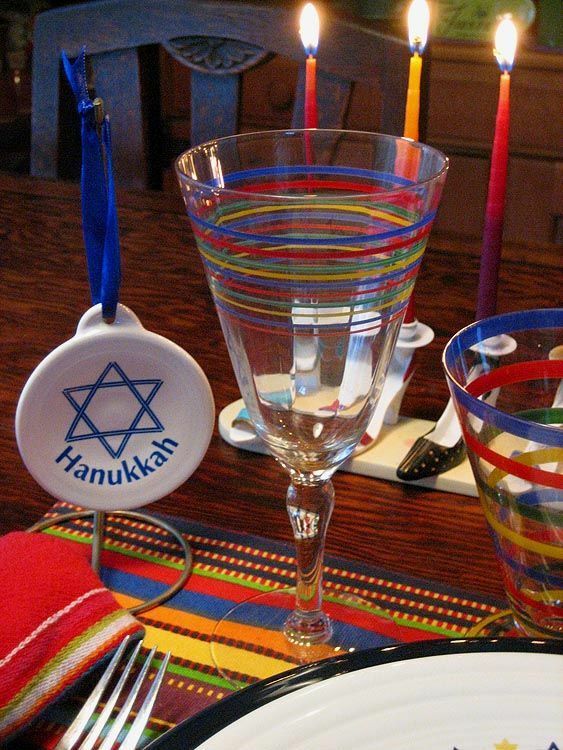 The Hanukkah ornament on a white Fiesta blank was specially made for me by one of my dear Fiesta friends. When neighbors gather for our annual Hanukkah party, some guests bring their own menorahs and we light them all together. 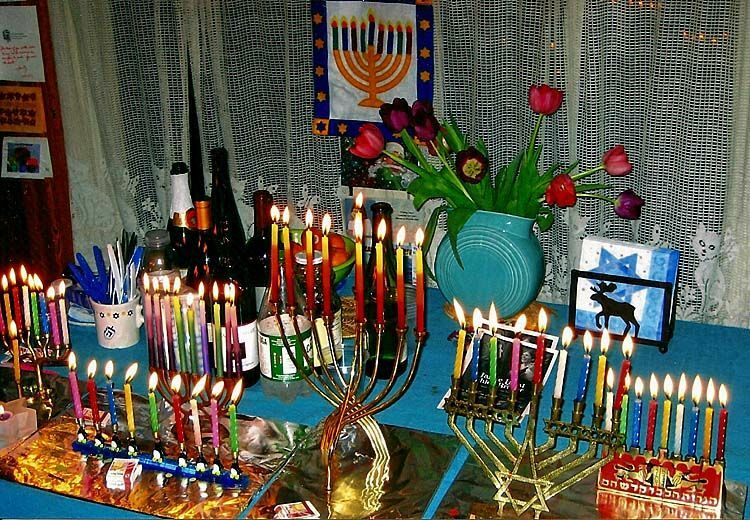 As you can see, menorahs come in all shapes and sizes, and a tableful of them with all their candles lit makes quite a spectacle! Of course in my house there’s always at least one piece of Fiesta on the table…a turquoise Fiesta Millennium II vase makes an appearance in more than one of these party photos! Finally, I would like to extend my sincerest thanks to Candy for giving me the opportunity to share my home with you and bring a few of my family’s Hanukkah traditions into your homes. Happy holidays to everyone! Thank you for sharing your celebrations past and present. I especially enjoyed seeing Noah through the years. 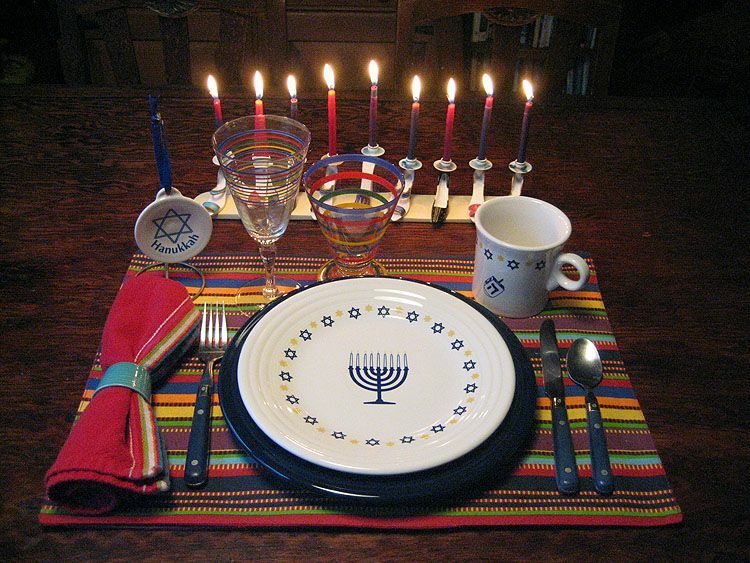 Your 8th night placesetting is great--a reflection of your personal style using Homer's very few Hanukkah pieces. The personalized ornament is the perfect crowning detail! 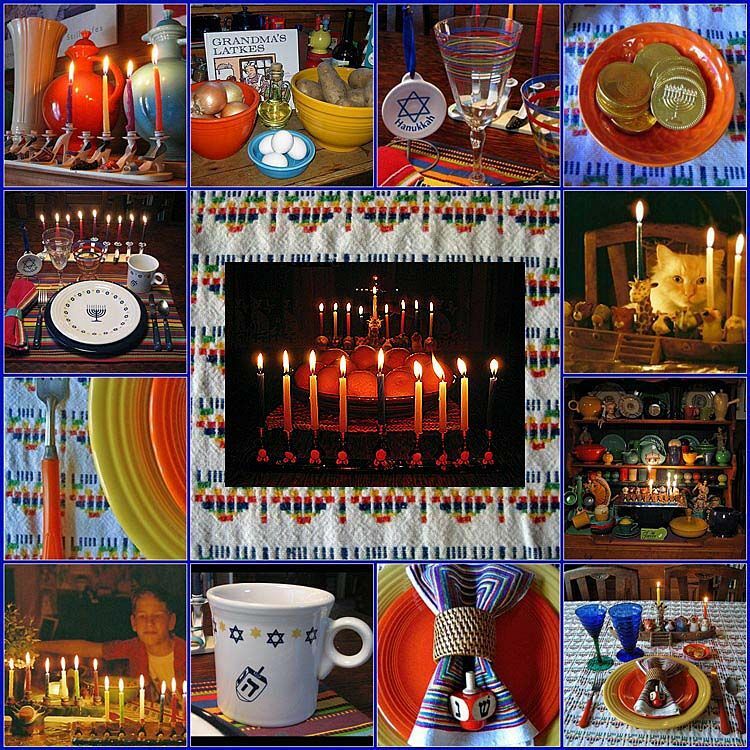 This post was so wonderful to get up to this morning, just beautiful images of the candles! Thanks so much for helping me out here on The Little Round Table Saarin! Maybe we can do it again for additional holidays......your relish tray with all the foods of Passover has always been a favorite of mine. 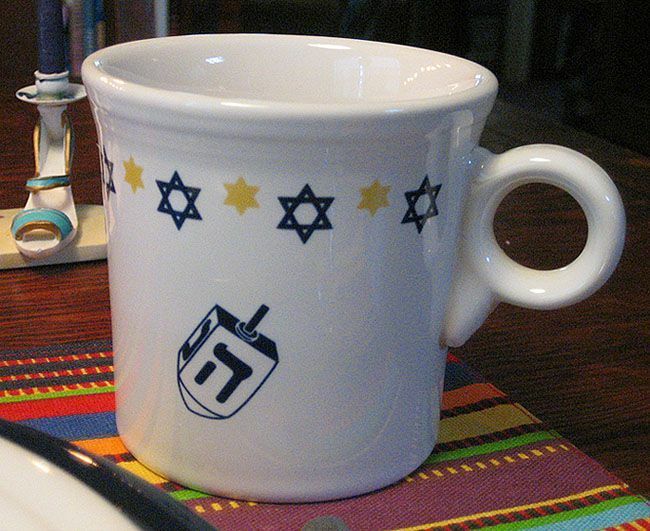 Thanks for all your nice comments, and for sharing Hanukkah with me! Now I have to go tool-up the latke factory for tonight's party! Happy holidays to everyone, whatever you celebrate! Saarin, took me awhile to get back here. I'm hoping the latke party was a success again this year.....I may have to try your recipe, I have a distinct taste for apple sauce and sour cream!! Everything was just lovely. The first photo was really stunning. 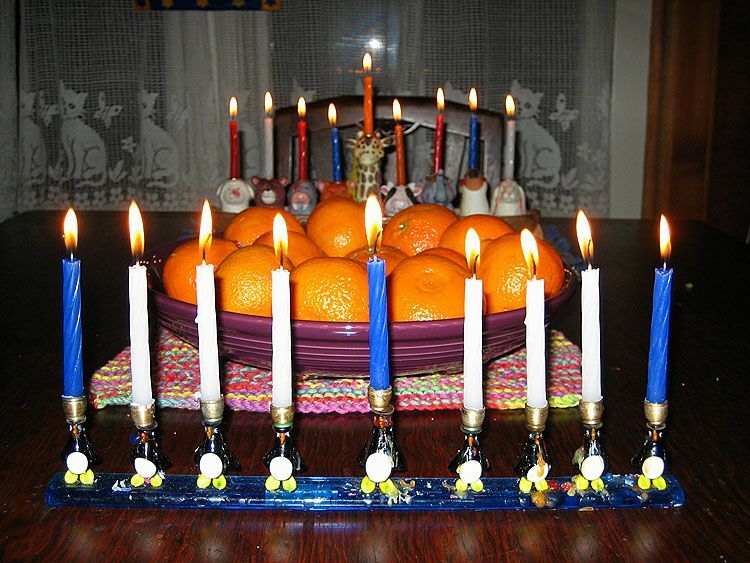 Happy Hanukkah. Thanks to Saarin for guest blogging again this year!